Executive Summary: Ram Karuturi, CEO of Karuturi Global, had already made his company the world's largest cut flower exporter. But he was also passionate about agriculture and wanted to make it big in the sector. In April 2008, the Ethiopian government offered him more than 300,000 hectares of land at a favourable price to grow food crops. Ethiopia, which faces huge food shortages, also has large tracts of undeveloped lands, but lacks the funds to make productive use of them. Ram Karuturi accepted. Food crops, however, were a new area for him. Huge investments were also needed. This case study, by the London School of Business, explores the problems the company faced and how it continues to tackle the challenges. In April 2008, Ram Karuturi, CEO of Bangalore-based Karuturi Global, received a proposal to set up an agriculture farm in a remote corner of western Ethiopia. The Ethiopian government was offering Karuturi more than 300,000 hectares - an area more than seven times the size of Mumbai - at favourable prices to grow food crops. Ethiopia and its neighbouring countries faced food shortages, but had an abundance of undeveloped land. 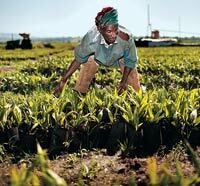 However, Karuturi had no prior experience with food crops, let alone farming on such a large scale. Outsized investments would also be needed to bring this land to production, and the risks were immense for the middling Rs 395-crore company Karuturi Global was then. The land offered bordered war-torn Sudan and had little infrastructure. However, success would make Karuturi one of the largest food producers in the world in a few years. The company was not new to such growth prospects. Incorporated in 1994, Karuturi had become the world's largest cut rose producer by 2008, exporting about 1.5 million stems of 40 different rose varieties a day to Japan, Australia, South-East Asia, West Asia, Europe and North America. It was no novice in Africa either. Most of its production came from two African countries - Kenya and Ethiopia. In about 15 years, the company had broken into the mature rose market dominated by European farmers, capturing about nine per cent of the European market share. The feat did not come easily. Although India liberalised its economy in 1991, it was still not an easy place to establish an export-oriented business of scale. Bangalore airport was not equipped with critical facilities such as cold storages, required for bulk export of perishables. Roads from the farm to the airport were underdeveloped, resulting in long delivery times due to traffic jams. Tax laws and bureaucratic procedures were still complicated and capital remained in short supply. "Ethiopia offered 300,000 hectares at $245 a week"
By 2003, Karuturi had become the lowest-cost and largest single rose producer in India. But the eight million roses a year the company was producing was still a negligible fraction of the global market. Costbased inflation was also eating into its bottom line. African rose growers, while exporting to Europe, had a significant cost advantage over those in India, which when combined with a favourable tax structure, resulted in lower cost to market of over 25 per cent. Realising that he would not be able to compete for long in the global market in these circumstances, Karuturi took the bold step of shifting production to Africa, starting in Ethiopia in 2005. He chose Ethiopia over Kenya - then the established rose production centre - as it had the same favourable climate as Kenya, but being less developed had lower establishment and operational costs. Moreover, Ethiopian exports to Europe were exempt from customs duty. Karuturi's decision to move into Ethiopia was fraught with risk. The company had no prior experience of operating on foreign soil and that too in an African country about which not much was known to investors. Given this uncertainty, the company was very cautious and spent a good deal of time on due diligence. "We decided to invest Rs 20 lakh, and I had at the back of my mind that the day I lost Rs 18 lakh, I would go home without thinking much about anything," Karuturi now says. 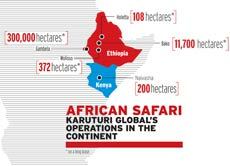 By 2006, Karuturi Global had managed to fully operationalise its first facilities near Addis Ababa and was looking at acquiring additional sites in the area for expansion. At this stage it got a chance to acquire one of the world's largest standalone rose farms - Sher Agencies. A Dutch family-owned rose producer was offering 188 hectares of its greenhouse assets in Naivasha, Kenya, which it had set up in the 1990s. After months of due diligence and negotiations, Karuturi finally bought out the assets for $67 million in September 2007, and in a single move became the largest producer of cut roses in the world producing over 650 million stems a year. Karuturi now had about 240 hectares of greenhouses producing roses in Kenya, Ethiopia and India. Revenues had reached $100 million for the first time with overall operating profit margins of over 35 per cent. With floriculture accounting for 97 per cent of the revenues, the company was looking to diversify and was already operating a small food processing unit for gherkins near Bangalore. It was also putting in place plans for the next phase of growth in Ethopia. "Karuturi roped in suppliers with high-tech machinery for his farms"
It was at this time the Ethiopian government offered Karuturi Global 300,000 hectares of virgin land rich in organic content on a 50-year lease at Gambela province of Western Ethiopia at an unbelievably low rate of about $245 a week. It was located on the banks of the perennial Baro river, making the entire offering very favourable for the company. The low cost of the land, however, reflected the risk inherent in the investment. It was located in the remote under-developed western corner of the country, close to the Sudan border with an uncertain security environment that required military protection. Until 2010, the area was connected to Addis Ababa by only a mud road. Gambela airport, the only port of access for investors was merely a small airstrip with a shed. With Ethiopia being land-locked, the Baro river was the only avenue available for transportation but this waterway was not developed and required travelling through areas with high security concerns. Yet amid these concerns Karuturi saw opportunity. He wanted to develop the area as an agri-economic zone with sugar factories, oil processing plants, rice mills and other food processing facilities on site. Joint ventures with established companies in each sector with specialised knowledge and organisational infrastructure would form the optimal route. Karuturi's own contribution would be in the areas of project implementation and execution, land development, and in facilitating the joint ventures by bringing in investors and companies. Areas would be developed in phases with a mix of short cycle crops such as maize and sugarcane to generate revenues towards investments in long-cycle crops such as palm oil which has a seven-year gestation period. The power to operate the planned facilities would be generated through a mix of hydroelectric power plants and rice husk and bagasse - a byproduct of the sugar production process-based power units. Capital would be raised through a mix of equity and debt offerings to both domestic and foreign institutions. By the end of 2009, Karuturi had begun land development in Gambela and in 2011 the company planted its first crop of maize, the easiest shortcycle crop possible in the area. Karuturi began with a conservative approach to the development of the Gambela land. With cost control firmly at the centre of its resource strategy, the company initially intended to procure low-cost farm machinery from suppliers in India they were already familiar with and deploy these. But it soon realised that Indian farm equipment was never designed to operate large-sized farms. It was more suitable for single family farms. After spending millions on equipment that lies largely unused today, Karuturi changed strategy in 2010 and began roping in suppliers such as the US-based John Deere which already had vast experience and high technology machinery products to serve industrial farms. It placed orders for large tractors and heavy duty ploughing, seeding, watering and harvesting equipment. Though servicing issues have not yet entirely disappeared, the changed strategy led to an immense and immediate gain in efficiencies. Attracting skilled labour has been another serious challenge - while there is enough local labour available, it is largely unskilled in modern farming. Karuturi thus has to spend a good deal of time training his workers. At the managerial level, though the company has been able to find talented people willing to spend time on site in Gambela, there has been criticism that many of its current managers have no experience in industrial farming and this is leading to many incorrect decisions, lost revenues and increased costs. Karuturi now plans to hire consultants with industrial farming experience from countries such as the US and Uruguay. But even the best strategies can be brought to nought by the vagaries of nature. Since the land adjoined the Baro river, the company, to guard against floods, had spent a lot of time and money building dykes along the entire stretch prior to planting its first crop. Even so in September 2011, a few weeks before the harvest, the area experienced floods that were stronger than in recent memory. Despite the dykes they wiped out crops that would have produced 50,000 tonnes of maize and delayed the project's first revenues. The stock market has been quick to pick on these execution risks. Karuturi Global's stock price has tanked. Says Karuturi: "I did not think the high valuations in 2010 were justified. We are a food producer, not an Internet start-up. At the same time current valuations are also unjustified." Karuturi's passion to become a global food producer of scale is the driving influence of his life at this moment. And like never before in its existence of 17 years, his company now has an opportunity that very few corporates of its size get. If the Gambela project is executed well, Karuturi will be one of the 10 largest food producers in the world. It will be a major producer of sugar and have its own brand of palm oil. There have been Indian companies like the Tatas that have made strategic acquisitions to gain global scale and outreach, but there are few examples of Indian companies generating scale through such large scale greenfield developments which are seen as high risk ventures. In this context, the company faces a clear challenge: it has to operate on scale to have a good chance of recovering its large initial investments and develop a sustainable production model, but at the same time it is constrained by its lack of experience in industrial farming. Managing cost will be critical going ahead and so will be raising of funds. The company recognises its challenges and is working on reducing risk in its development plans. Says Karuturi: "A big motivation for taking up this project was the Ethiopian famine in 2008 when the project was offered to us. We believe, with this project, we can alleviate the shortage of many food crops in the country." Karuturi's is an inspirational entrepreneurial story. It demonstrates that entrepreneurs are high on imagination even if low on resources, in contrast to large corporates. They chase opportunities that large firms would find impossible to pursue. Going to Africa and that too the war-torn border of Ethiopia, in order to farm roses and later other agricultural products would seem a bridge too far for most. Whether Karuturi succeeds or not will depend on his ability to garner the capabilities needed fast enough to execute these projects, maintaining a positive cash flow. And, of course, good luck never hurts. At present, the firm does not have the capabilities to execute this expansion. But then entrepreneurs rarely do when embarking on a new venture. For Karuturi, it is essential to map the needed capabilities in terms of assets, processes and knowledge. Next he must ascertain which of these competencies exist within his firm and which have to be built, acquired or partnered, and from where. If he can manage this fast enough to meet his financial obligations, he will succeed. Risk appetite has to be matched by the capacity to quickly learn and absorb execution skills. Previously, with his roses business in Africa, he has demonstrated the ability to do so. Finally, what is apparent from the case study is that working within India is increasingly being seen as a constraint to growth by ambitious entrepreneurs. Unlike in China, the infrastructure often puts a cost penalty on firms desiring to use India as a global platform. As a result, entrepreneurs seek overlooked, unknown destinations to realise their dreams. A month ago, the Ethiopian Ambassador to India was in Chennai to appoint an honorary consul as well as to seek investments for Ethiopia. Though puzzled about investment opportunities in Ethiopia, I did attend the meeting, where the Ambassador invited Ram Karuturi to narrate his experience. His gripping story electrified the audience, leaving many listeners keen to replicate his success. Karuturi came to the dais an unknown Indian and went back a hero. Will Karuturi make it or not? His earlier dream of becoming the largest cut rose exporter in the world is now a reality. There remain many unanswered questions about some of his projects, why did the previous Dutch owner agree to sell the farm to Karuturi? How did Karuturi leverage $67 million to buy it? Well, Karuturi did not become the largest rose exporter by fluke but by strategy, hard work and tenacity. He will also make it in the food farming business. Karuturi is already acknowledged as an adopted son of Ethiopia. He seem to have a clear roadmap for the new project too - a combination of growing shortcycle crops and long-cycle crops as well as using technology to drive operating efficiencies. There is enough of a market for food in Ethiopia and the western countries with which Ethiopia has preferential trade arrangements. But there are questions such as how quickly will Karuturi put together a managerial team, be it from Ethiopia or elsewhere, or how well he will leverage his learnings from the flower business into foodgrain? Karuturi is young, ambitious, yet humble. I will bet on his success. Not tomorrow, but over the next decade! A previous version of the full case study had different formatting. The content remains unchanged. Was Karuturi right to take up the project? Has he bitten off much more than he can chew? Can Karuturi achieve his dream of making Karuturi Global one of the largest food producers in the world? Send in your views to btcasestudies@intoday.com. The best response will win a book by Professor Nirmalya Kumar, Co-director of the Aditya Birla India Centre at London Business School.